Broad Heath Blogs»Class Blogs 18-19»Class 6 Blue Blog 18-19»Year 6 trip to Sidney Stringer to meet author A F Harrold. ← 1 Red-Learning about the seasons! Year 6 trip to Sidney Stringer to meet author A F Harrold. This entry was posted in Class 6 Blue Blog 18-19, Class 6 Red Blog 18-19, Class 6 White Blog 18-19, Uncategorized. Bookmark the permalink. 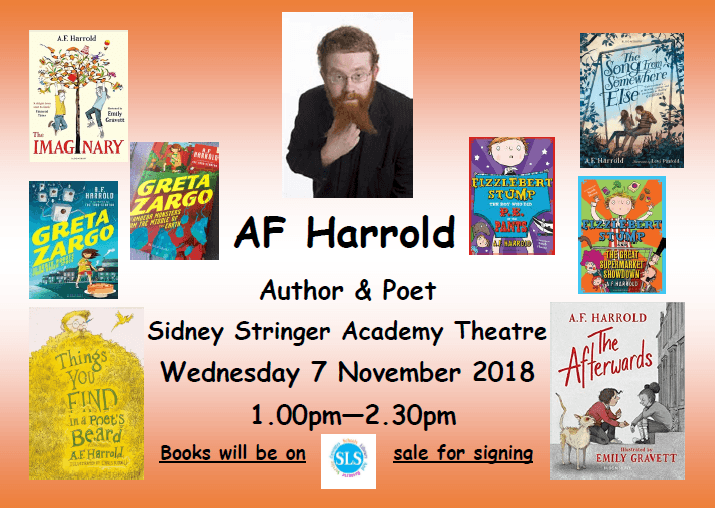 The trip to Sidney Stringer to meet A.F Harrold was fascinating as we learnt about him as an author; in depth and had the opportunity to get one of his books. Thank you Mrs Frankish, I really appreciate it. I enjoyed learned more new book from Sidney Stinger and they have a great author and who is AF Harrold. It was fun ,thank you Mrs Frankish 🙏🏼. I really enjoyed going to Sidney Stringer because the author was funny and I also got too see my brother at the school. I also might like to get one of his books. Pleased you gained from it Zeynab. I really enjoyed our visit to the author and I think this a great opportunity for us.A.F Harrold likes to write about funny books that make people laugh.A.F Harrold writes nonsense books for example in one of his book is about a cat and the cat has a imagenery friend. What a wonderful opportunity for the year six students to see an author and gain an insight into his career. The children were able to ask questions and listen to a few pieces of his written material. A lovely afternoon which was enjoyed by everyone. Thenkyou so much Mrs Frankish,Mrs Edwards,Miss Ahmed,Mrs Hurt,Mrs Caur,Mr Patel,you are so Nike I loved it so much the part that I really hated was when we went in the rain I was soaking wet AF Harald wrote some really good books and also some good poems he is really funny even my teachers Miss Ahmed and Mrs Edwards said that I am exactly like him because he dose not like normal things he likes to be wierd and funny I have a lot more that I want to say but I like just can not explain how but in my mind I can explain it in my head. Thanks to all the teachers for giving us the opportunity to go and visit A.F Harrold and gain some information about poetry.